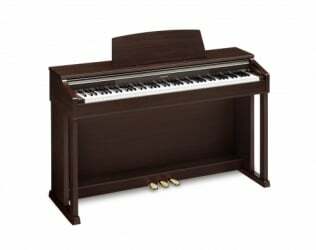 88 keys with hammer and touch response with ivory feel, 128-note polyphonic, 16 sounds, metronome, 60 internal songs, reverb, chorus, brilliance, internal 2-track recorder, transpose function, SDCard slot (up to 2GB), 3 pedals, 16 channel multi-timbral (receive), MIDI in/out, 2x headphone outputs, line out L/R jacks, USB jack type B, 2x 20W loudspeaker system. Dimensions: 1395 x 835 x 427mm. Weight: 40kg. Colour brown.